"I am pleased to have played a small role in assisting such an admirable and promising young woman as she pursues her post-secondary education goals." 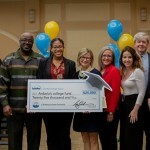 NEWARK, Del.--(BUSINESS WIRE)--Ardavia Lee, a senior at Saint Elizabeth High School, was surprised with a $25,000 Bridging the Dream Scholarship from Delaware-headquartered Sallie Mae, the nation’s saving, planning, and paying for college company. Lee, who assumed she was only a finalist for the scholarship, was revealed as the winner during an event at the Chase Center in front of her family, members of the Wilmington Fire Department, elected and community leaders, previous scholarship recipients, and hundreds of Sallie Mae employees. Lee was also surprised with congratulatory videos from all three members of Delaware’s congressional delegation. Sallie Mae’s Bridging the Dream Scholarship recognizes high school juniors and seniors who excel in academics, athletics, community service, or school activities, but whose financial circumstances may not permit them to fulfill their college dreams. Lee is one of only seven recipients from across the country. A model of resiliency, Lee is the daughter of fallen Wilmington Firefighter Lt. Ardythe “Ardy” Hope who died in 2016 fighting a fire in Canby Park. Despite the enormous setback, she has excelled in the community, the classroom, and on the court. School counselor Shannan Beck, who nominated Lee for the scholarship, was by her side for the surprise announcement. Following in her mother’s footsteps, Lee is dedicated to helping others, completing more than 100 hours of community service in the last three years. She has maintained a 3.94 GPA, and thrives in both volleyball and basketball, where she loves motivating her teammates. Lee’s goal is to continue to help people as she follows her dream of going to law school. The Delaware Bridging the Dream Scholarship honors the legacy of former executive, and architect of the Bridging the Dream Scholarship Program, Charlie Rocha. The Rocha family was on hand to announce Lee as the recipient. 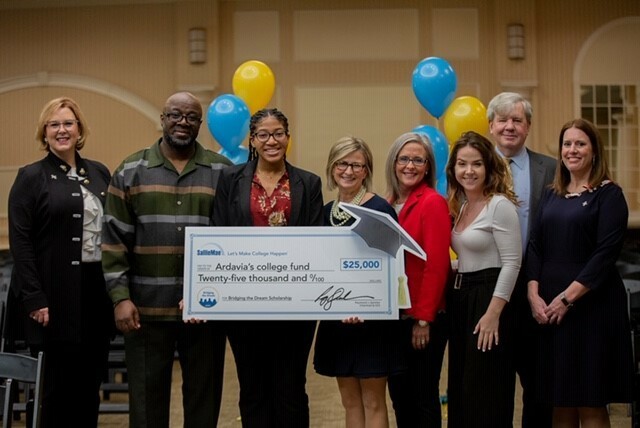 Since 2016, Sallie Mae has awarded nearly half a million dollars in scholarships to undergraduate and graduate students through the Bridging the Dream Scholarship Program, including more than $125,000 raised directly by employees through various fundraising activities. For more information about Sallie Mae’s Bridging the Dream Scholarships, visit SallieMae.com/BridgingTheDream, or join the conversation by using #BridgingTheDream.